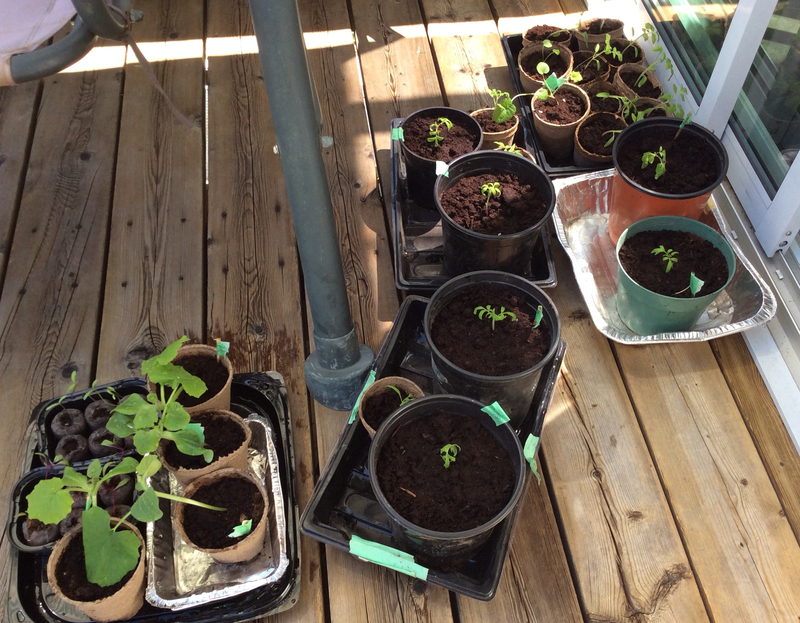 I'm presently sitting out on my sunny deck amidst my seedlings, taking a break and having tea. I'm smelling (still amazed to have smell) the grass and the few flowers and leaves that have bloomed. I have to remember that it is unseasonably warm today and it will still be a couple of weeks before they can be planted. However, I did put some cold crop seeds in the raised bed: radishes, spinach, and kale. After my doctor's appointment this morning, I went to the pool for some gentle exercise, sauna and whirlpool. I'm hoping it will help me on my drive tomorrow. 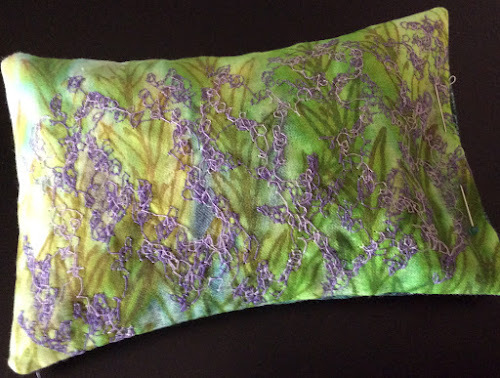 I feel unsatisfied if I can't have a little creative playtime, so I squeezed in a bit of free motion with black thread on the painted canvas that I've been working on. 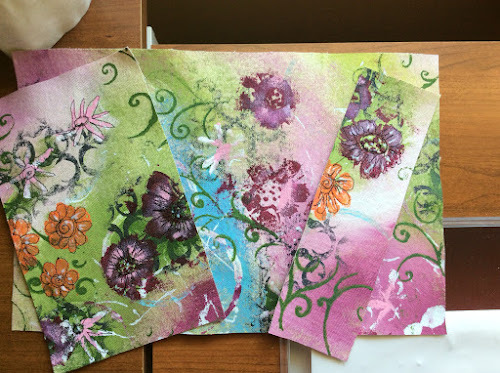 I'm making some bookmarks. Darned if I can't get the photos I cropped to upload. I'll show more another day. You wouldn't be able to see anyway that I added some foiling glue which needs to dry before I add some foil accents. I hope you're enjoying your week and squeezing in a few minutes of creative play, whatever it be. Since the last post, I've been to PEI for my mother's 80th birthday. The women in the family, my sister, two SIS's, two nieces, my daughter and I, and oh yes, baby Russell, took her to the spa for manicures or pedicures, followed by lunch. She doesn't look 80 does she? This was the first gift for baby that I gave my daughter. I made the socks and sweater. She was pretty excited. 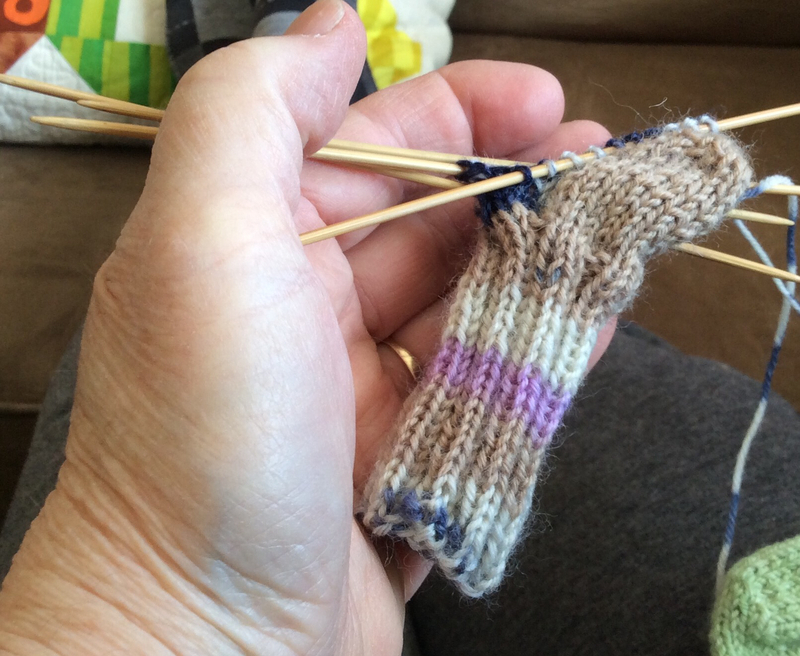 You know I'll follow be a way to knit, torn bursa or not. 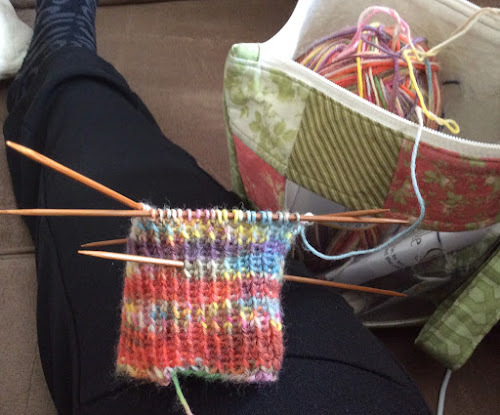 I got home late Sunday and was pretty tired yesterday, but I went to my sock knitting group after lunch. I've started a new pair. Love the color. This morning, I had a doctor's appointment where I got the results of the MRI of my shoulder. It seems that I have a bad tear in the largest bursa. That would explain the pain and the fact that I can barely get dressed or use my right arm. I've not had an accident or anything just like happened withe tear in my knee. Maybe something to do with the cortisone I've been on even though it's a small dose. So now I wait to see when I can get in for surgery. Wait times are not good here. In the meantime I'm working on another article. 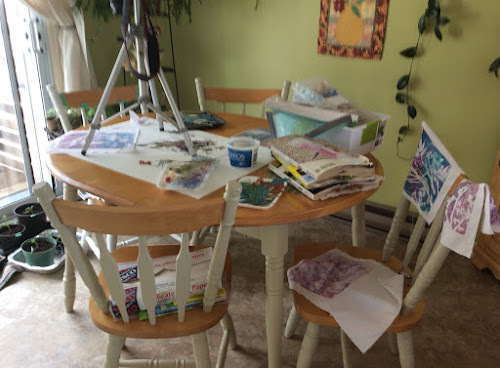 Rather than work downstairs at my painting station, I brought everything up to the dining table to do some Gelli prints where the light is better for photographing. It's a little harder on the back so I didn't play too long. This is one of my least favourites so I won't be featuring it. Tomorrow, I have to go for the fasting diabetes test. It involves drinking that sickeningly sweet drink. Not fun, but necessary. I seem to be having a run on tests lately. I'm anxious to get it all over finished! I've started reading a new book recommended by a blogger, You Are Not Your Pain, by Vidyamala Burch and Danny Penman. It's an 8 week program using mindfulness to relieve pain, and stress. It comes with a cd. I've just started the 1st one. I'll try anything if it means less medications. It has been cold here this week too. I'm hoping for some warmth soon. I arrived home last night form my first, I think, successful trunk show. I stayed pretty organized, managed to tell a few amusing stories and seemed to inspire some of the quilters. I stayed with a friend from some 30 or so years ago where we used to live. 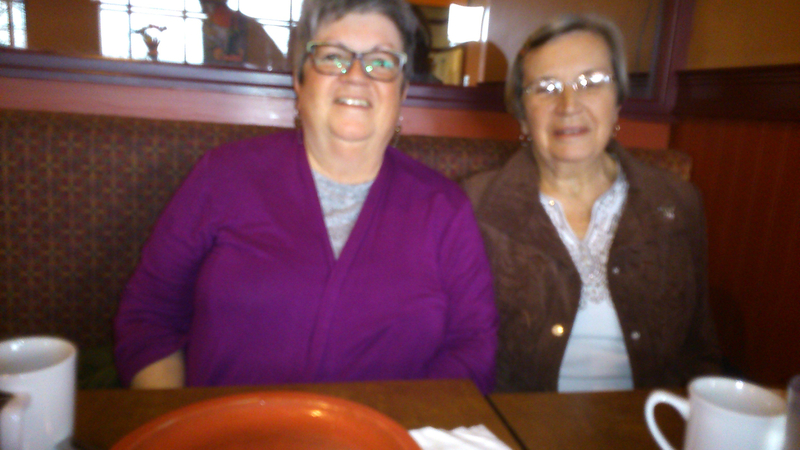 We had a lovely visit with lots of gab and I was treated to some good food. It's funny how the years can slip by, you can meet with old friends and it seems as if no time has passed. 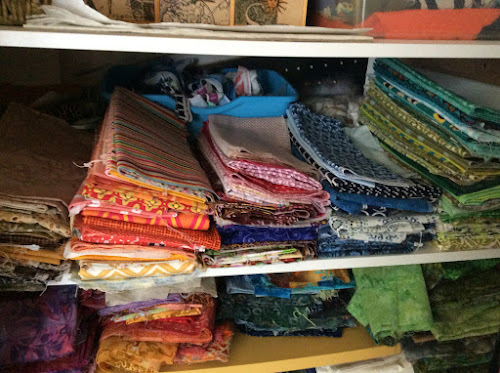 My host took me to a small quilt shop and I also visited a new yarn shop, Cricket Cove, before I left the city. 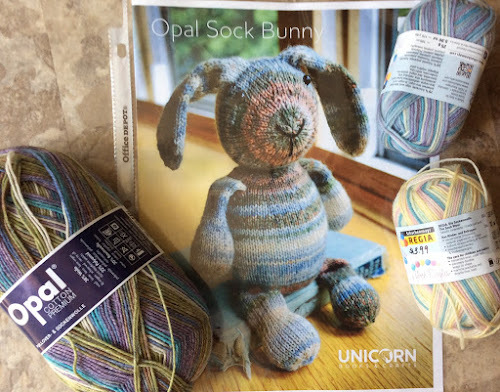 I picked up the bunny pattern along with the wool as well as two baby balls of sock yarn. The little socks are so fun to knit! The painter arrived first thing this morning to do my bedroom. Once I got him organized, I picked up a friend and went to the pool for some gentle exercise. After lunch, I potted up a few tomato plants. 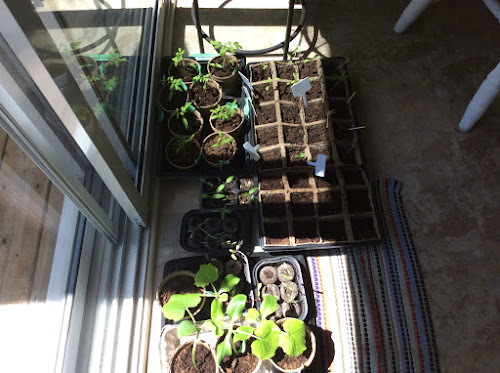 These are some of my seedlings inside the sliding door in the dining room. The larger ones in the foreground are different kinds of squash. 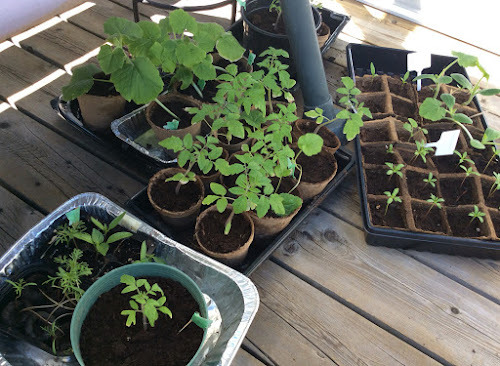 Some of the tomatoes that I potted on the right. I also edged and churned up the spot where I have some sunflowers against the fence. 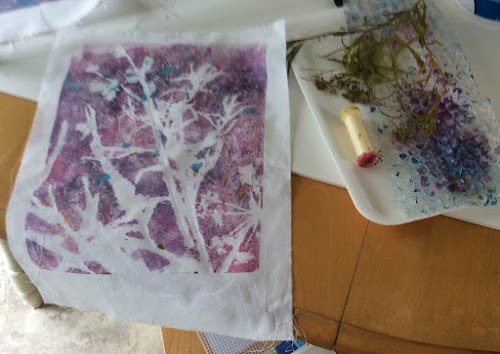 This year I'm putting in a few hollyhocks that I've started. A blogger friend was kind enough to send me some of her seeds when I commented on how much I loved them. Having done the first coat, the painter has left, so I'm resting with my usual heat and ice. It's not quite showing the true color and it's only the first coat, but I like it. On Friday, I'm heading out again to visit family on PEI. 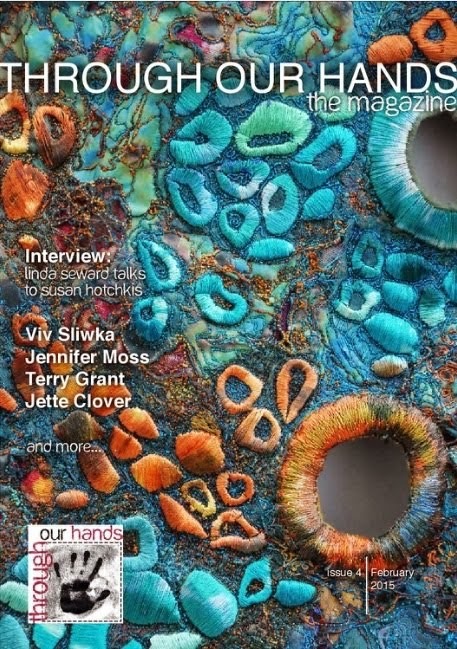 Between travelling and gardening, I'll have a hard time to squeeze in any fiber art in the next few weeks. And on top of that, I'll be working on another article which will require som prep work that I can't show. Forgive me if posts will be a bit slim in the next few weeks. I hope you having a nice week and that you're enjoying the outdoors no matter where you are. I've not been perfectly regular here lately. 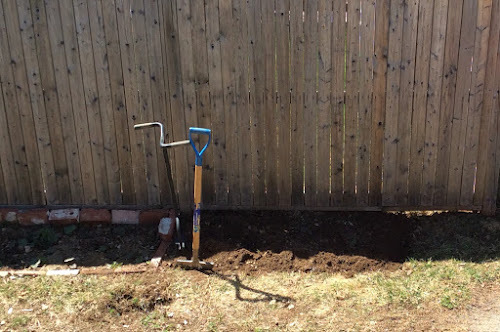 It's a time of the year when the outdoors is calling, a time for uncovering the shrubs, clearing away twigs and brush, getting the gardens ready and a time for starting my vegetable seeds. Besides all that, I've had sinus surgery, gone to Moncton for an MRI and gotten a shot to the hip at the hospital. For the first time in many years, I can smell and I had good results with my hip so far as well too. This afternoon, the sun broke through the clouds and the air warmed. 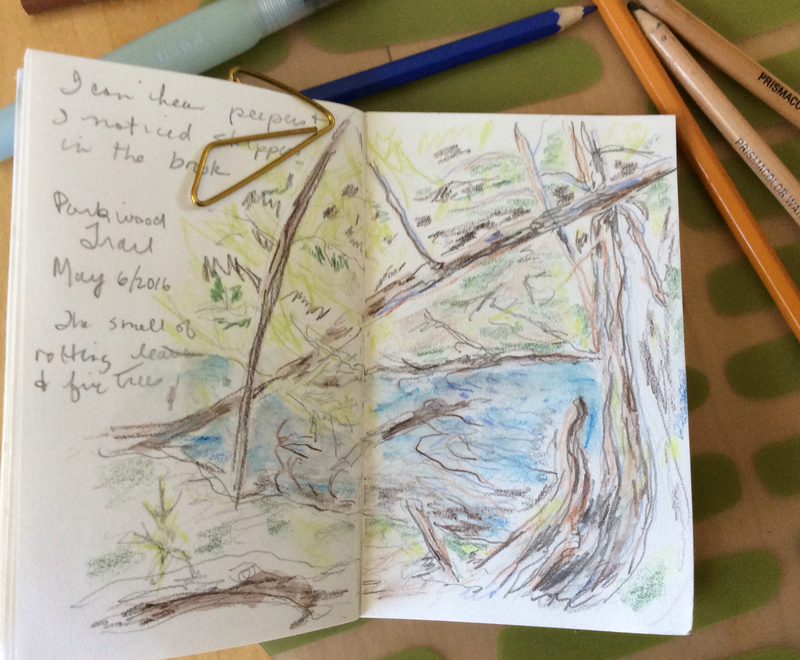 I drove over to the trail and walked part of it, going down across a little brook and sitting on a stump to sketch. A very rudimentary sketch. It just feels nice to be able to get out. Along the trail, the peepers were loud and the sweet smell of fir and pines wafted by as I passed. One cannot imagine how nice it is to smell when I've had none for so long. There are no leaves out yet; however, I spied a few colourful buds. 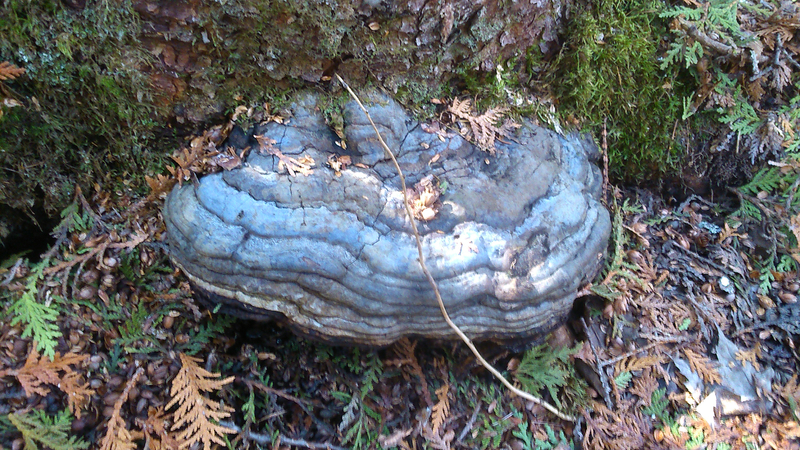 On my way out of the woods near the brook, I spied this fungus growing on a tree stump. It was about 10" across and the colors were beautiful. Look at the blues. Gorgeous. I found a parcel in the mailbox on my way home. A surprise form my son for Mother's Day. 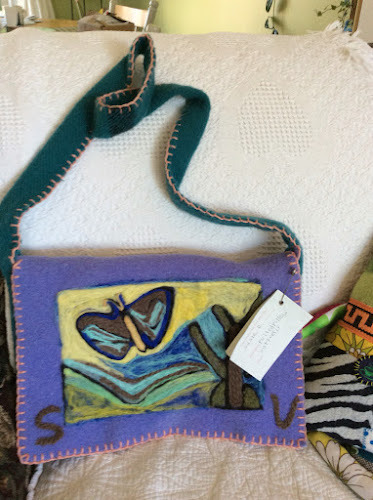 It's a felted bag made by people with limited abilities at a place in Nova Scotia called The Ark. Sweet. Yesterday, my friend who loves to organize came for a visit and did her magic on one of my shelves. She ironed and refolded every piece. You can see the difference between the two. I'll hate to mess it up. While she worked (she insists it's fun and relaxing), I finished another little sewing kit. 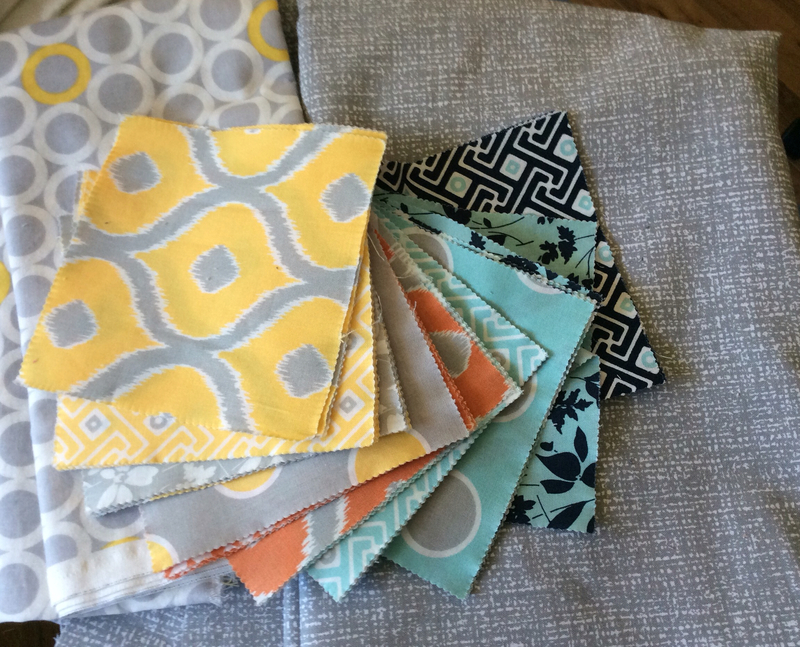 I've also picked some modern fabrics for a gender neutral baby quilt. The best news is that my husband and I are going to be first time grandparents- a real baby, not puppies! 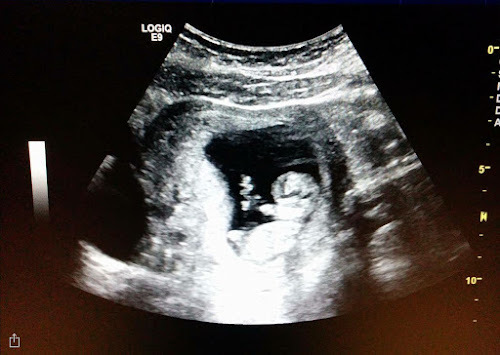 My daughter is due November 19th. 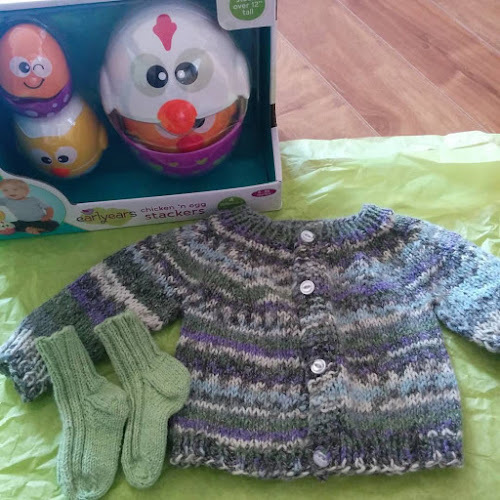 There'll be lots of knitting and stitching going on here. Tonight, I'm packing for one of the last two UFO days tomorrow. I'm taking another baby quilt along with a couple more sewing kits that are in the works. 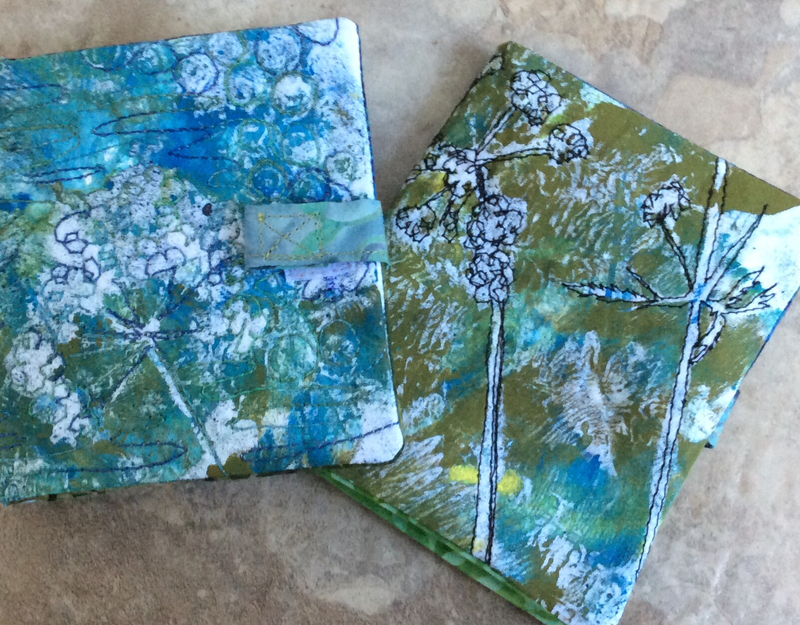 After that, I'm packing for a trip to Fredericton on Monday/Tuesday where I'm doing my first trunk show ever for a guild there. I've accepted because the request came from a freind that I haven't seen in 30 some years! We connected on Facebook. 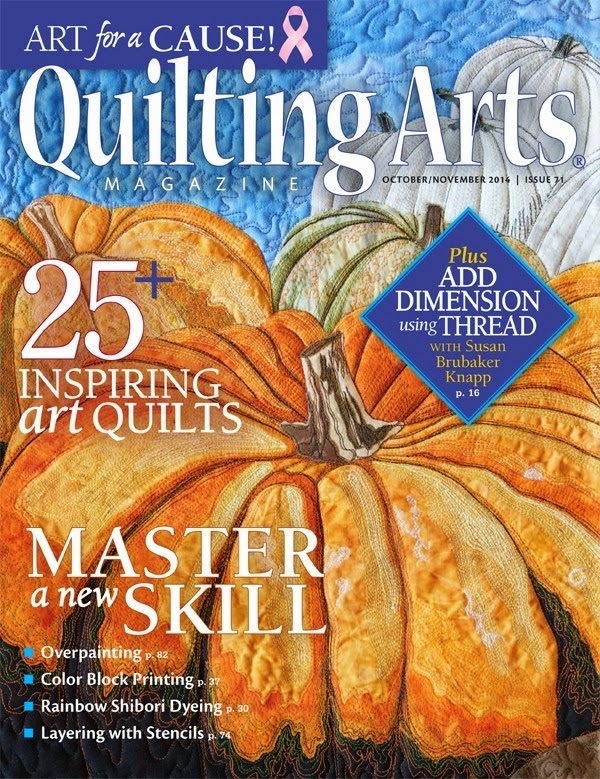 She's a quilter and had the chance to see one of my pieces in an art gallery. It will be fun to reconnect. 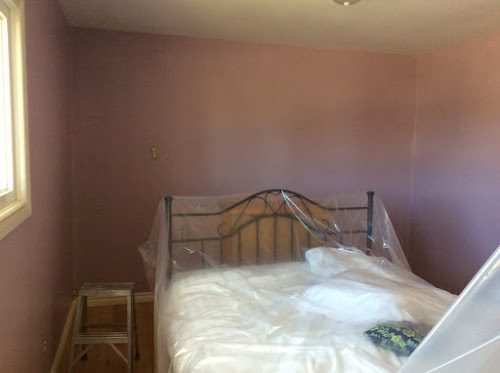 While I'm away the painter is coming to do my bedroom. I'm going for a completely different look and color, inspired by a bedroom in my new favourite show on Netflix, Miss Fisher's Murder Mysteries. 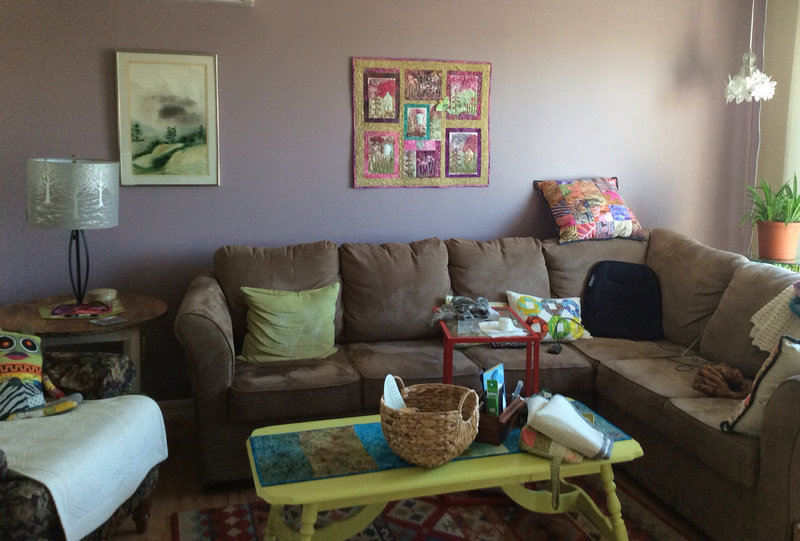 It's a shade lighter than the living room wall. So that's all my news. I'm wishing you all a lovely weekend and a Happy Mother's Day. I've been a little slow in the creative department. In the last two weeks, I've had sinus surgery. Gotten a cortisone shot to the hip under X-ray, and had an MRI. I've gotten my smell back for the first time in many years. And just in time for spring. We finally just had a stretch of sunny weather which melted a lot of our snow and the air is warming. I spent quite a bit of time outside on the weekend. This morning, I stitched up a little gift that I needed for a donation to a basket at quilt guild. It measures about 3 by 6" and is filled with lavender.